1 avec le bain, toilettes et lavabo. Notes sur l'hébergement: Au premier étage il ya 2 chambres avec balcon et A / C. Piscine. Grand jardin. Voir - il a été décoré avec goût et meublé. Extérieur: Sud Est maison et le jardin. Jardin privé gazonné. 4 x 8 mètres piscine. Chaises longues et meubles de jardin fourni. BBQ. un parking privé. Aire de jeux avec toboggans et des balançoires. Le jardin à l'arrière est planté d'oliviers, d'orangers et de citronniers, de figuiers et d'autres types d'arbres différents. Statues de dieux antiques grecs sont placés à travers le jardin. Service de nettoyage / serviettes / / Femme de ménage: Draps et serviettes fournis, Autres: Séparée petit salon avec la cheminée et 1 canapé-lit. Beautiful place with nice owner which have been nice and helpful. Just returned from an amazing week in Athens staying at this beautiful villa in the famous town of Marathon nearby. The weather was lovely, even at the end of October, and so we could make use of the pool and lovely gardens as well as the nearby beach which is the site where the Persians landed prior to the battle of marathon. It is a short drive of approx 45 mins into the centre of Athens to explore the historic sites and the region is littered with other sites of historic significance and beautiful scenery. The owners of the villa are very friendly and helpful to ensure everything is well and that you have a great stay. I would definitely recommend and would stay again if returning to the region. We (parents with 2 children 9 and 15) had a lovely holiday! Everything was simply wonderful! The house, the place, the pool, the surrounding etc. The house is very good equipped. Everything you need was there. It has a big garden with many play options for children. There are supermarkets, bakerys, a market and very good restaurants nearby (our favourite is Taverna Lekka). Georgina and her husband were very friendly and helpful. Thanks you two for everything! Lovely villa. The location is great for children, as there is a huge garden and selection of outdoor toys. The private pool makes the villa ideal for relaxation and chill time without having to go too far. The view is beautiful and the villa has everything you might need for a family holiday. There is only a short drive to some lovely beaches that are great for swimming and sandcastle building. The owners are really welcoming and helpful. We had a lovely week here and plan on going back. The owners Georgina and her husband were very helpful. 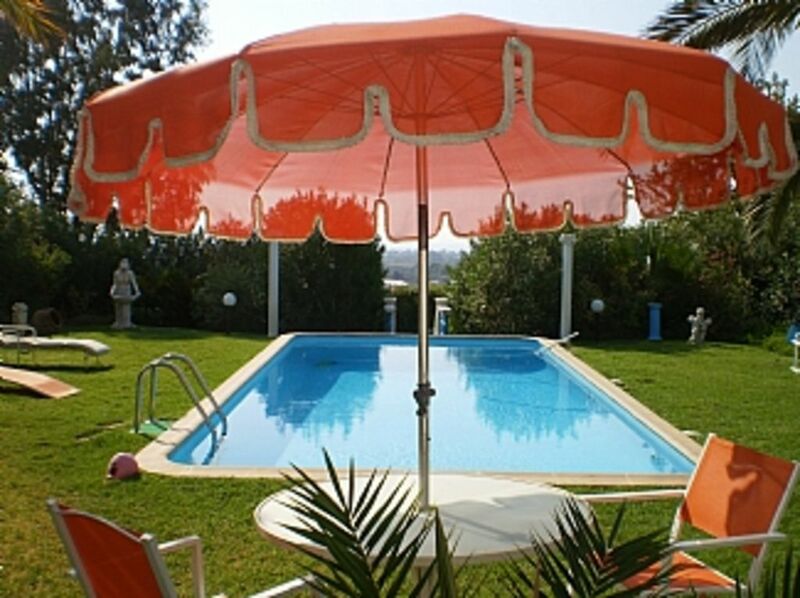 The property was well equipped and has a lovely pool. The gardens are lush and pretty with an orchard at the rear with fig trees. Delicious. The description of local attractions and location was very accurate while the beaches were really very clean and many to choose from..We enjoyed the wind surfing and paddle boarding. Delphi and particularly Athens were also within easy reach. We had a fantastic holiday and found the villa very comfortable for the 4 of us which I would highly recommend it to a friend. 4 minutes en voiture de la plage de Schinias (3km). offrant le ski nautique, la planche à voile, kanoeing et d'autres activités nautiques. S'il vous plaît noter, Moraitis accueille des courses de triathlon au long de l'année, surtout pendant la période estivale. Aéroport international d'Athènes "Eleftherios Venizelos", situé à Spata, est à 40 km (40min en voiture). Le port de Rafina est à 20 km (20 min en voiture), où vous pouvez facilement prendre les ferries qui vont à la plupart des îles de Cyclades (Mykonos, Paros, Naxos, etc). Harbour Pirée, le principal et le plus grand en Grèce, où la plupart des ferries partent pour la plupart des destinations insulaires, est à 45 km (50min en voiture). Accès à partir de / vers le haut, l'utilisation de la voiture est indispensable. (carhire disponible dans l'aéroport). 2 minutes en voiture au village de Marathon. 3km la distance de conduite de bord de mer. (Baie de Schinias). 3km du champ de bataille historique de Marathon. 5km de musuem archéologique de Marathon. Marathonas village possède tous les commerces locaux, supermarché, restaurants, bureau de poste, banques, stations-service, le musée et le lieu de départ de la célèbre course Marathon. Booking Notes: Please contact the owner for booking dates that will fall under Christmas, New Year and Easter Season. 30% non refundable down payment. Balance to be payed on arrival. Christmas and Easter holiday please contact owner about rent price. Changeover Day: Please contact owner. Notes on prices: Christmas and Easter holidays have different rental prices so please contact owner.